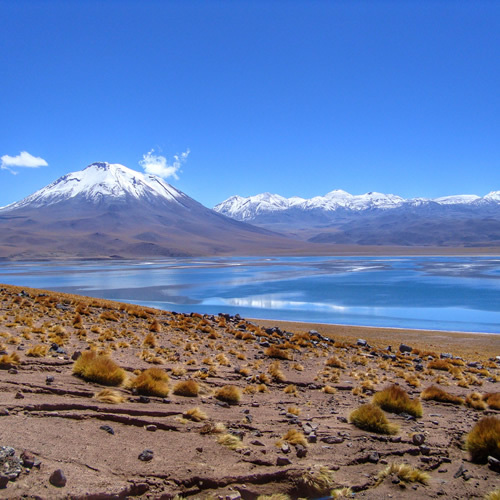 Northern Chile is mainly characterized by its desert – one of the driest in the world, for their National Parks, white sandy beaches and warm waters of the Pacific Ocean and for many cultural events that combine the influence of indigenous Andean cultures with the Spanish conquerors. The city of Arica with its highland area that includes the Lauca National Park, Lake Chungará and indigenous cultures. 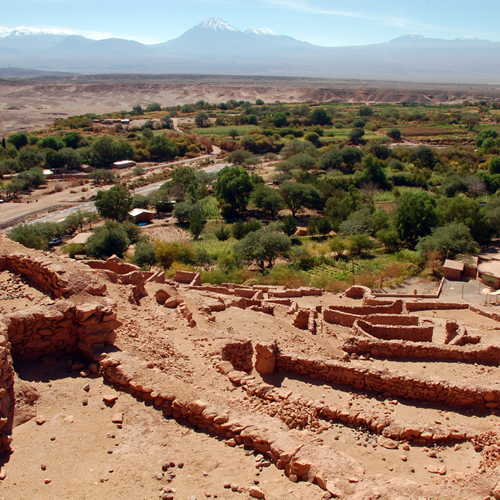 Iquique, with its nitrates such as Humberstone and Santa Laura, as well as its petroglyphs and geoglyphs as the Atacama Giant. 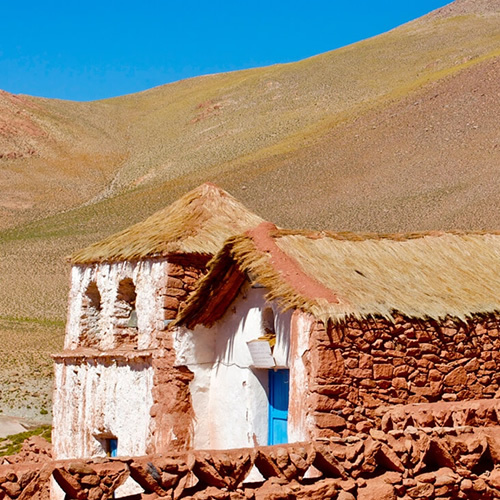 San Pedro de Atacama, the most popular town in the Atacama Desert because of its geological formations such as salt flats, geysers and hot spring in addition to its important archaeological sites and native cultures. 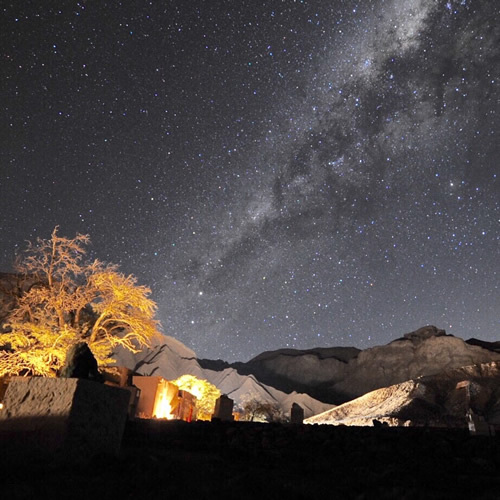 The Elqui Valley, with its main attraction the clear sky is perfect for stargazing. Near the city of La Serena, Damas Island offers great possibilities to observe penguins, dolphins and sea lions in their natural environment. 2 hours flight from Santiago. Approx. 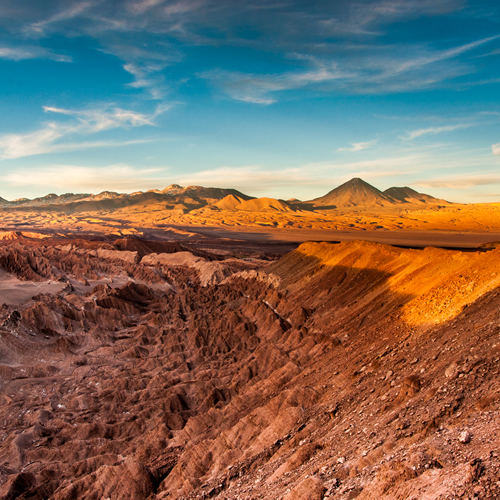 8 daily flights from Santiago to Calama year-round. Walk sneakers or trekking boots, termal clothing (indoor and outdoor), t-shirts, swimwear, long pants and long-sleeved shirts, rain jacket, glooves, hat for cold nights (during the winter), sunglasses, sunblock and lip protector. Moon Valley - Death Valley - Atacama Salt Flat - Tatio Geysers & Village of Machuca - Tara Salt Flat - Puritama Hot Springs - Quitor Fortress - Tulor Citadel - Miscanti & Meñique Lagoons - Rainbow Valley - Candelabros Cacti Valley - Catarpe Valley & Cornisas - Toconao Village - Cejar Lagoon among many others. Dec./ Jan./ Feb. Mar./ Apr./ May Jun./ Jul./ Aug. Sep./ Oct./ Nov. Moon valley, famous for its natural mineral sculptures, one of them being “Las Tres Marías” (The three Mary’s) formed by the wind erosion, resembling a lunar setting. Death Valley, visited to practice sandboarding, has great geographical beauty, where its salt formations appear to be sculptures or natural works of art. Pukará de Quitor, a Pre-Hispanic stone fortress constructed by the indigenous that dates back to the 17th century. Today it represents an archeological monument and its great historical importance lies in the “Battle of Quitor”, one of the first clashes between Spanish and indigenous, in the beginning of the conquest. Next, learn about what is known as the “Culture of San Pedro” at the village of Tulor. Despite of its age it has been well preserved thanks to the natural conditions of the place. Atacama Salt Flat, one of the most important in the world due to its great extension. Inside the salar, we will see three types of flamingos that live in Chile. Then over the 4.300 meters above sea level, will visit the Miscanti and Miñique lagoons, with fantastic scenery of bluish waters arising from the background volcanoes. Finally will visit Toconao, the main square, the bell tower built in 1750 made of cactus wood, mud and straw, and the church of San Lucas, both declared National Monument since 1951. 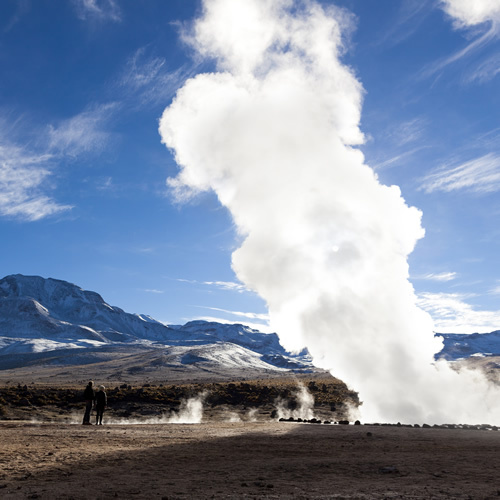 At dawn we will departure towards the Altiplano, reaching an altitude of 4,320 meters above sea level, to visit the Tatio Geysers; one of the most important geothermal fields in the world. Thanks to the cold and extreme temperatures, we can see large columns of steam. Taking the same way back, we stop for a few minutes in the wetlands of Putana, where it is possible to appreciate different species of birds in front of the volcano Colorado and the town of Machuca, where the original altiplanic architecture is reflected by its church. We will start our active bike ride with more than 6 river-crossings. We will feel the adrenaline rushing through the “Cordillera de la Sal”. Catarpe is the only green valley in this place and stands out for his little church and the trek to the summit of Pucara de Quitor, ruins of an ancient fortress of the eleventh century. We depart from San Pedro de Atacama, and drive for 6 km (3 miles) by transfer to the motorcycle base. Explore the plentiful of the Atacama Desert through an ATV QUAD SAFARI, crossing big sand dunes and rivers to get to what we call the Dark Side of the Moon. We will be able to appreciate spectacular views of the Salty Range and the Valleys. Our ATV QUAD SAFARI is offered at beginner and intermediate level to suit your ability. 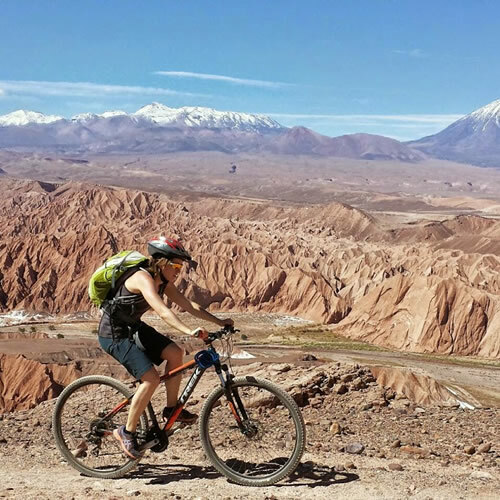 Upon completion of the tour, it is time to return to the base and take the transfer back to our hotel in San Pedro de Atacama. We will start out experience in Guatin, walking and bordering the Puritama river, discovering warm waters that deliver wonderful fertility in the foothills. We can appreciate varied vegetation, but the Cardón, is the type of cactus that in this ravine can reach until 7 meters of height. We finish the trekking in the Puritama Hot Spring where the waters that flow from the mountain range raise its tempeture and make this place one of the most beautiful places in the north of Chile. 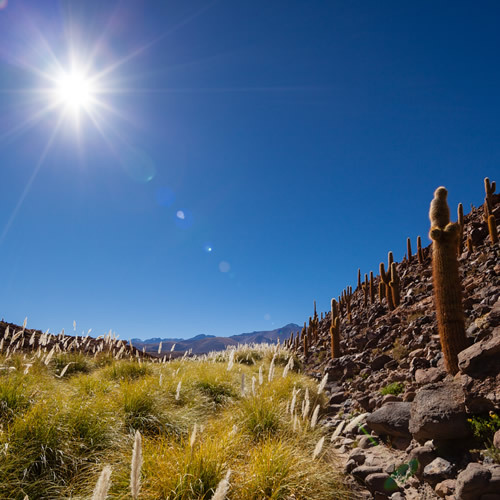 Almost at the end of the day, we will leave from San Pedro de Atacama to experience and arqueo-astronomy session where expert guides will explain us how the Atacameños sages, also known as Licanantay, realized observation of stars long before the arrival of Spaniards. We will talk about the “Rio de Estrellas” name given by the Atacameños to the Milky Way, and the huge importance that diserve for the Day of All Saints this great journey after the death.